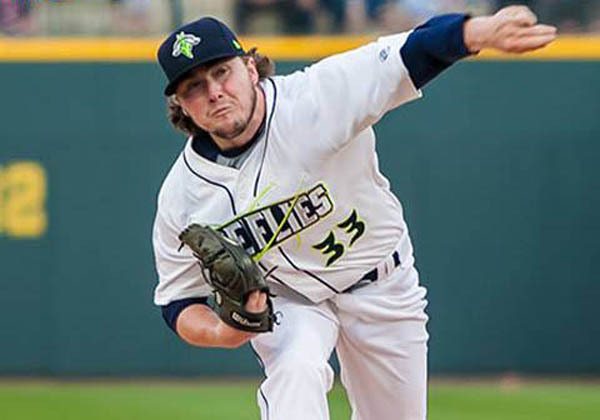 A FALLS Road baseball player has moved one step closer to playing major league baseball following a number of stellar performances in the USA’s Eastern League. PJ Conlon was brought up on Rockville Street just off the Falls Road, but he and his family moved to Orange County, California in 1996. His dad, Patrick is originally from Lenadoon and emigrated to California in 1980. 23-year-old PJ made local headlines two years ago when he was drafted for the New York Mets on the back of his consistent college baseball performances for the University of San Diego. Since being drafted he has had a number of impressive spells at the Met’s minor league affiliates. His performances for the St Lucie Mets saw him named as the Mets minor league pitcher of the year in 2016 and his recent performances for the Binghampton Rumble Ponies have earned him a spot in the 2017 Eastern League All-Star Classic on July 11 and 12 – his second straight mid-season selection for All-Star games. The rising baseball star currently ranks second in the league in strike-outs fueling speculation about a potential move to the major leagues. If that happens then Conlon would be one of under 50 Irish baseball players to have played major league baseball.